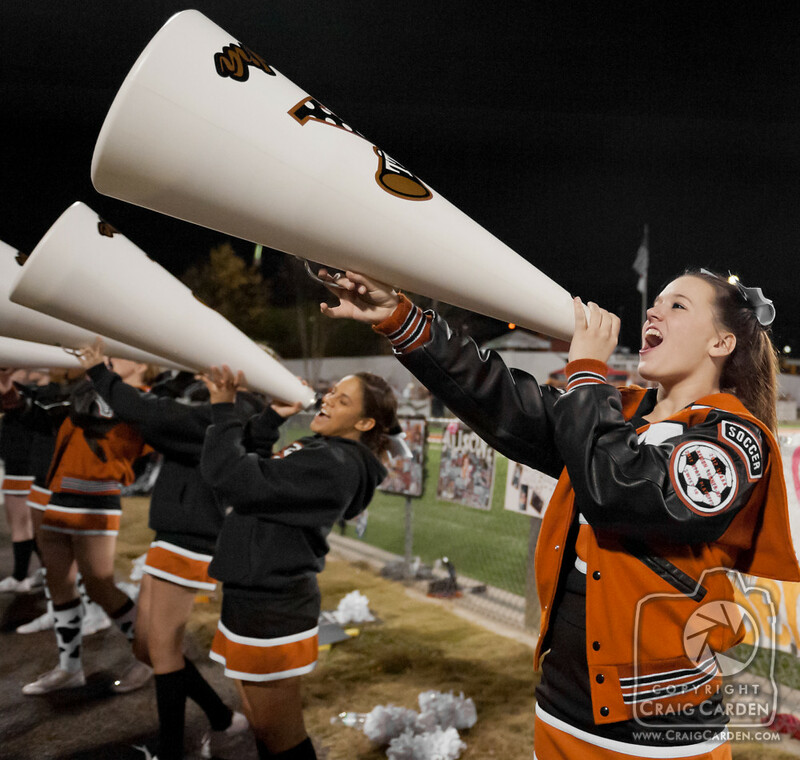 When my eldest niece joined her high school's junior varsity cheerleading squad, I offered to drop by a game and take some pictures (as one does for family). Coaches were consulted, introductions were made, and permission granted. I had expected this to be a one-off event, simply to get a few pictures for my niece’s own enjoyment, as well as that of her doting grandparents. Once the coaches and the rest of the girls on the squad saw the results, however, it quickly turned into a weekly appointment. 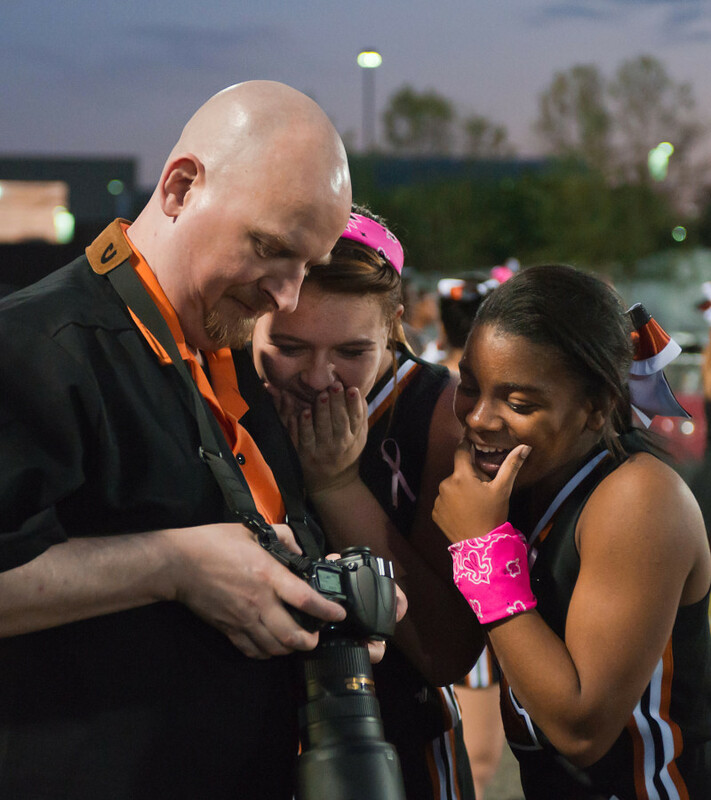 I didn't mind, since being on the sidelines of a football field was a welcome reminder of the days when I started being "serious" about photography. 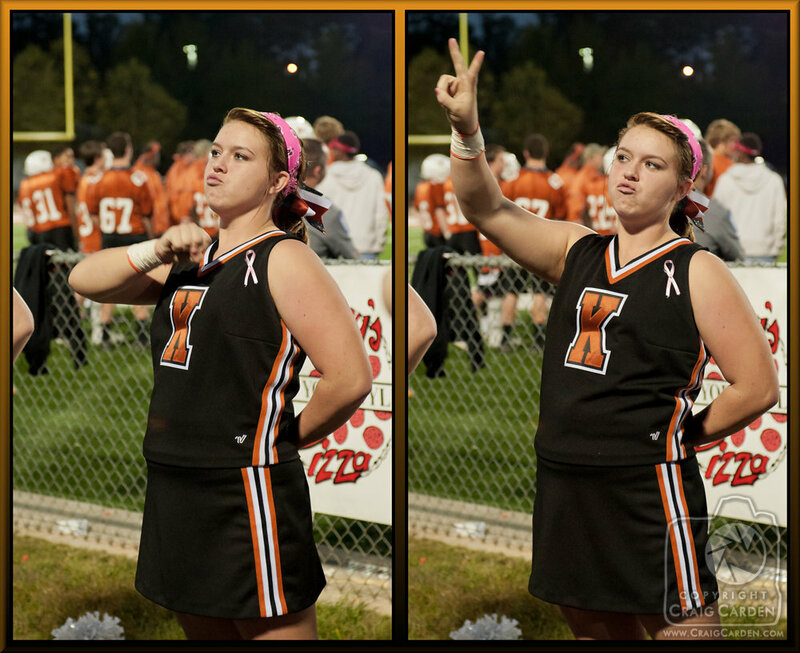 It was also interesting to note the differences between photographing football and cheerleading; There was much less running up and down the field as the ball moves, but there were far more variables when it came to the cheerleaders' facial expressions, movement, formations, etc. that could make or break a shot. The "puzzles" the work presented kept me on my toes, and made the time spent at the games fly right by. The evolution of the squad's reactions also brought about some noteworthy insights. At the first game, the questions were generally limited to a variation of "Are you going to take pictures of everyone?" "Probably, as long as you don't mind," I said. No one objected, but I could sense a mild undercurrent of concern about how the photos would turn out. 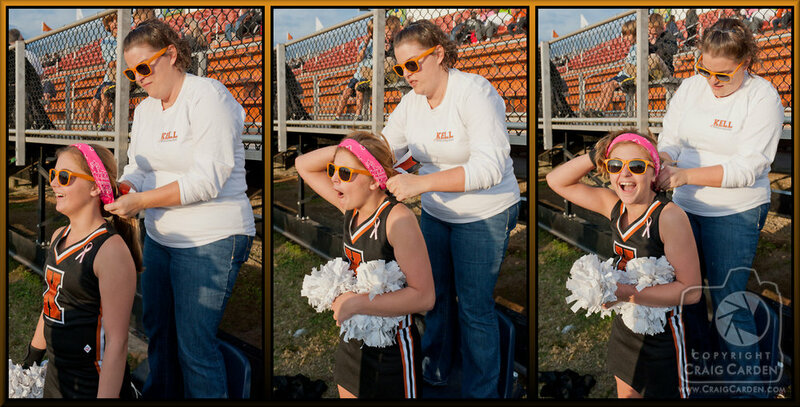 This was when I realized another key difference between football and cheerleading. Football players don't have to worry about how they look; Their job is to grunt, grind, and sweat their way through every play of the game, while the only thing anyone really pays attention to is where the ball ends up between the white lines on the field. Cheerleaders, meanwhile, spend the same amount of game time working through their own athletic efforts (ranging from choreographed routines to tumbling passes, and some truly dangerous aerial stunts), but they're expected to look flawlessly coiffed and cheerful while doing so. To football players, photographs are a record of gridiron glory. The words "bad hair day" don't apply, and no one ever tells them to smile. The girls in the uniforms face a different kind of pressure; more subtle than simple win-or-lose, but every bit as real. By way of reassurance, I offered them my philosophy. "I'm not here to make you look bad," I said. "Generally speaking, I don't set out to take 'bad' pictures of anyone, but if I do somehow, it will never make it out of the camera. As far as I'm concerned, my job is to make everyone here look as good as possible." That seemed fair enough to ease any concerns, so as the game started, we all went to work. The following week, after the girls saw their initial run of photos (and sent them back and forth to friends over social media! ), the squad warmed up considerably. First, the shift was subtle; Apprehension about the shiny glass eye of the lens looking one way or another disappeared to a point at which it was all but ignored. Then, the mindset seemed to shift from "We have a game today," to include the added note, "...AND we're getting our pictures taken!" The JV squad was less regimented than their varsity counterparts, but by week three, the JV hair and makeup game seemed to be raised to a varsity-grade, "camera ready" level. By week four, I started getting requests: "I've been working on my high jump split. Can you get a picture of it?" Sure. "Can you get me doing a tumbling pass?" Of course. "We've got an awesome side-by-side jump! Can you get us doing that?" Absolutely. I crossed the last hurdle into being "part of the team" when I noticed that thanks to the layout of the field and the home stands, the squad had no choice but to spend their time on the sidelines facing straight into the afternoon sun to keep up with what was happening in the game. I'd only been there a few weeks, but if I ever happened to forget to bring my sunglasses onto the field, I wound up regretting it. I could only imagine how the squad and coaches must have felt, week-in and week-out through a full season. One day, as I saw the squad shielding their eyes against the glare, I joked to no one in particular, "You all need orange sunglasses." One of the girls apparently heard me, because she giggled, turned around, and replied, "Yeah, I know!" The next day, I made it a personal mission to get the coach's approval for some ZZ Top-esque "cheap sunglasses" for the squad. The internet made short work of the search, and by the following week, everyone had bright orange sunglasses. They were a huge hit, and added a fresh layer of fun to the photos. The volume of pictures I took each week eventually reached a number that was utterly impractical to distribute via email, so I set up a basic photo blog where everyone from the girls on the squad, to their coaches, parents, extended family, friends, and so on, could check in a download whatever they liked. I've never been a social media participant, but I was told that the pictures saw a lot of traffic on the "book of faces." After a month or so, the JV coach mentioned that the varsity squad had begun wondering why the JV girls got a weekly trove of pro-grade photos, while they had not. (After all, some of them were seniors!) It wasn't long before the varsity coach asked me to come by some of their games as well, and get photos of their squad in action. 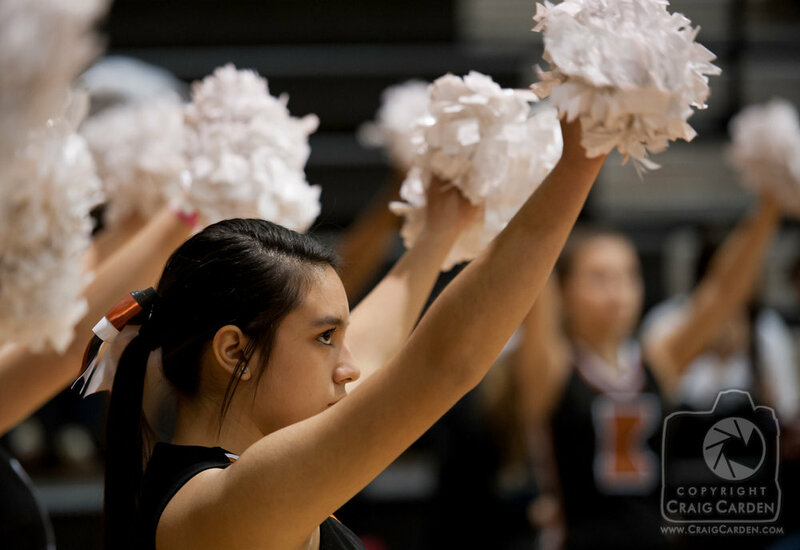 This was a new revelation for me in and of itself; Cheerleading has come a very long way since my own high school and college days. A good number of the varsity girls were also on the "competition" team, and the intensity and complexity of their routines showed it. Theirs was definitely the modern “sport” style of cheerleading, with adrenaline amped up to the proverbial eleven. Eventually, my niece rose through the ranks of high school, and started counting down to her graduation day. Some of the remaining underclassmen on the squad asked me, with unvarnished hopefulness, if I would keep coming to the games and taking pictures. It was an honor just to be asked the question, but I had to tell them that unless their coaches specifically requested that I return, I would probably be "graduating" from the squad as well. Looking back at these photos now, I can confirm that this was some of the most fun I've ever had with a camera. The work was the best kind of challenge, yielding the best kind of results: enthusiastic enjoyment by photographer and subject alike. Best of all, being around this much youthful exuberance and activity was like plugging myself into a battery charger. Even at the end of a long day of “regular” work, I always looked forward to going to the games to keep my sports eye sharp, and renew my spirits from the gigawatts of energy that surrounded me on the sidelines. 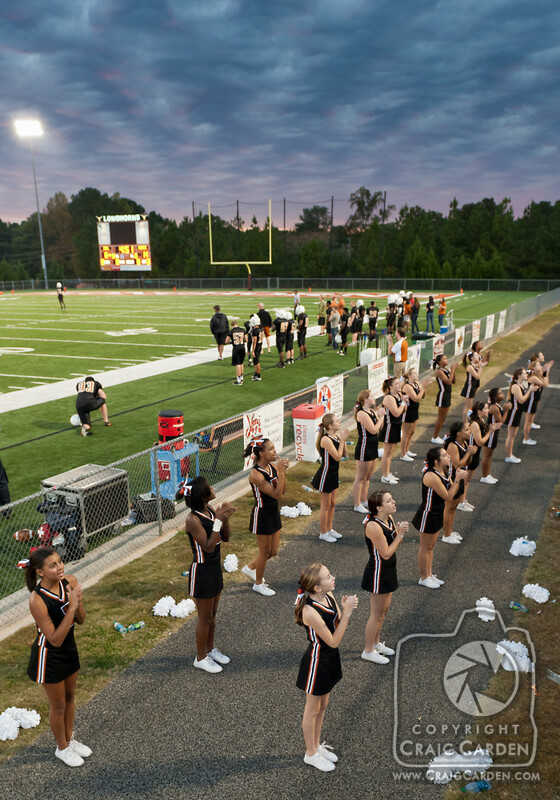 My thanks to Kell Cheer coaches Cosgrove, Adams, and Burrus, and all the amazing young ladies on the squads. 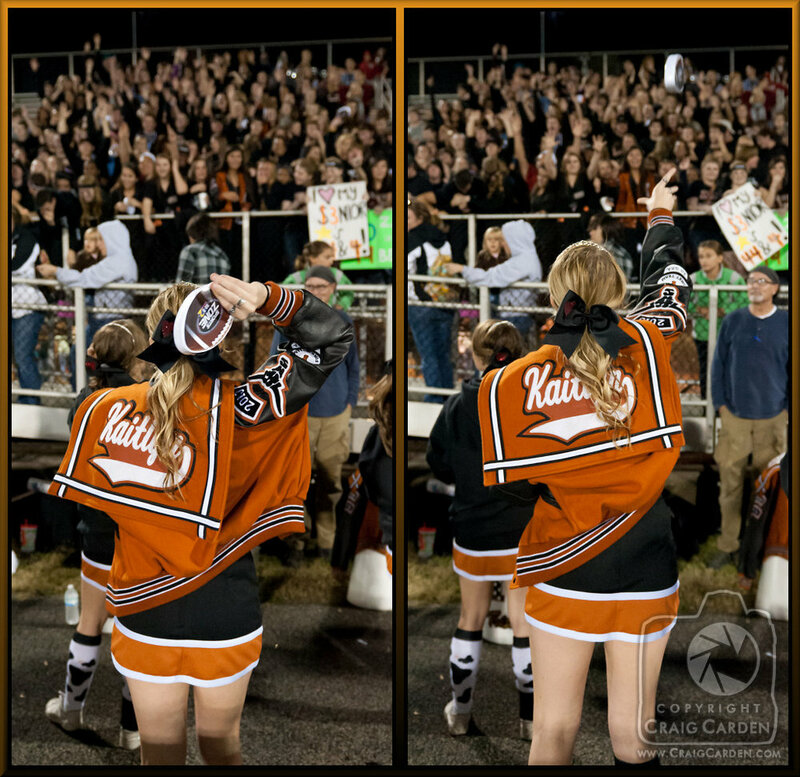 It was a true joy and privilege to be your un-official "official" photographer!